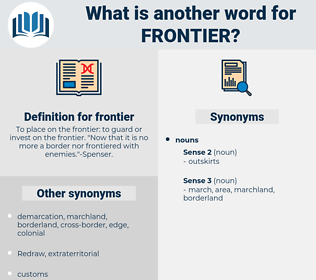 What is another word for frontier? 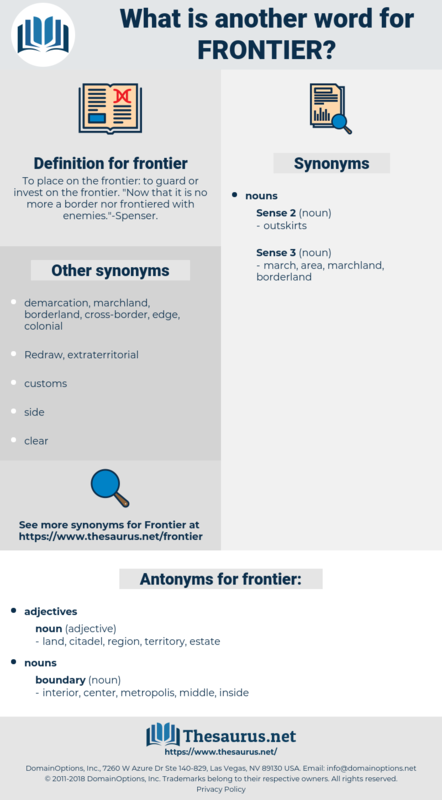 To place on the frontier: to guard or invest on the frontier. " Now that it is no more a border nor frontiered with enemies. "- Spenser. barriers, constraints, achievers, Movements, domains, lands, caps, frontline. exploratory, threshold, frontline, barrier, avant-garde, frontrunner. land, citadel, region, territory, estate. interior, center, metropolis, middle, inside. This referred to those farms of his - she had by now settled on three - which she wanted to round off her frontier. Those little frontier wars were endless things once they started. field of study, bailiwick, subject field, discipline, study, subject, subject area, field. bounds, bound, wild, wilderness, boundary.